These highlights do not include all the information needed to use ABRAXANE safely and effectively. See full prescribing information for ABRAXANE. DO NOT SUBSTITUTE FOR OR WITH OTHER PACLITAXEL FORMULATIONS. To report SUSPECTED ADVERSE REACTIONS, contact Celgene Corporation at 1-888-423-5436 or FDA at 1-800-FDA-1088 or www.fda.gov/medwatch. Sensory neuropathy is dose- and schedule-dependent [see Adverse Reactions (6.1, 6.2, 6.3)]. The occurrence of Grade 1 or 2 sensory neuropathy does not generally require dose modification. If â‰¥ Grade 3 sensory neuropathy develops, withhold ABRAXANE treatment until resolution to Grade 1 or 2 for metastatic breast cancer or until resolution to â‰¤ Grade 1 for NSCLC and pancreatic cancer followed by a dose reduction for all subsequent courses of ABRAXANE [see Dosage and Administration (2.5)]. Sepsis occurred in 5% of patients with or without neutropenia who received ABRAXANE in combination with gemcitabine. Biliary obstruction or presence of biliary stent were risk factors for severe or fatal sepsis. If a patient becomes febrile (regardless of ANC) initiate treatment with broad spectrum antibiotics. For febrile neutropenia, interrupt ABRAXANE and gemcitabine until fever resolves and ANC â‰¥ 1500, then resume treatment at reduced dose levels [see Dosage and Administration (2.5)]. Severe and sometimes fatal hypersensitivity reactions, including anaphylactic reactions, have been reported. Patients who experience a severe hypersensitivity reaction to ABRAXANE should not be rechallenged with this drug. 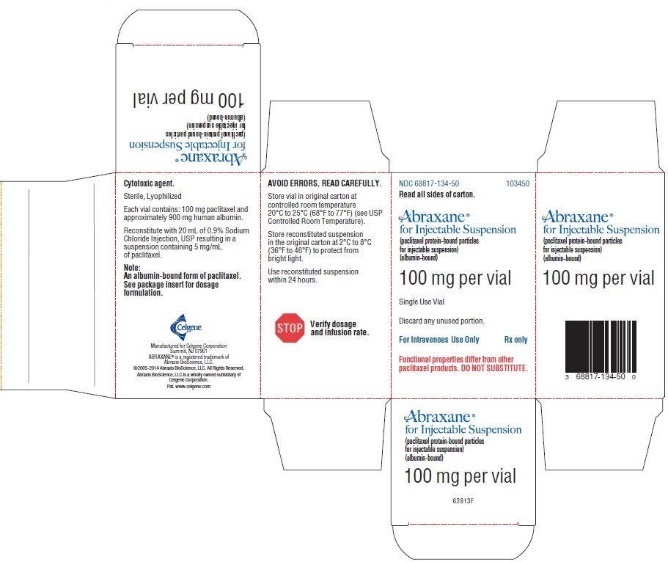 Cross-hypersensitivity between ABRAXANE and other taxane products has been reported and may include severe reactions such as anaphylaxis. Patients with a previous history of hypersensitivity to other taxanes should be closely monitored during initiation of ABRAXANE therapy. Because the exposure and toxicity of paclitaxel can be increased with hepatic impairment, administration of ABRAXANE in patients with hepatic impairment should be performed with caution. Patients with hepatic impairment may be at increased risk of toxicity, particularly from myelosuppression; such patients should be closely monitored for development of profound myelosuppression. ABRAXANE is not recommended in patients who have total bilirubin >5 x ULN or AST >10 x ULN. In addition, ABRAXANE is not recommended in patients with metastatic adenocarcinoma of the pancreas who have moderate to severe hepatic impairment (total bilirubin >1.5 x ULN and AST â‰¤10 x ULN). The starting dose should be reduced for patients with moderate or severe hepatic impairment [see Dosage and Administration (2.4), Use in Specific Populations (8.6) and Clinical Pharmacology (12.3)]. Advise females of reproductive potential of the potential risk to a fetus. Advise females of reproductive potential to use effective contraception and avoid becoming pregnant during treatment with ABRAXANE and for at least six months after the last dose of ABRAXANE [see Use in Specific Populations (8.1, 8.3) and Clinical Pharmacology (12.1)]. Based on findings from genetic toxicity and animal reproduction studies, advise male patients with female partners of reproductive potential to use effective contraception and avoid fathering a child during treatment with ABRAXANE and for at least three months after the last dose of ABRAXANE [see Use in Specific Populations (8.1, 8.3) and Nonclinical Toxicology (13.1)]. The most common adverse reactions (â‰¥ 20%) with single-agent use of ABRAXANE in metastatic breast cancer are alopecia, neutropenia, sensory neuropathy, abnormal ECG, fatigue/asthenia, myalgia/arthralgia, AST elevation, alkaline phosphatase elevation, anemia, nausea, infections, and diarrhea [see Adverse Reactions (6.1)]. The most common adverse reactions (â‰¥ 20%) of ABRAXANE in combination with carboplatin for non-small cell lung cancer are anemia, neutropenia, thrombocytopenia, alopecia, peripheral neuropathy, nausea, and fatigue [see Adverse Reactions (6.2)]. The most common serious adverse reactions of ABRAXANE in combination with carboplatin for non-small cell lung cancer are anemia (4%) and pneumonia (3%). The most common adverse reactions resulting in permanent discontinuation of ABRAXANE are neutropenia (3%), thrombocytopenia (3%), and peripheral neuropathy (1%). The most common adverse reactions resulting in dose reduction of ABRAXANE are neutropenia (24%), thrombocytopenia (13%), and anemia (6%). The most common adverse reactions leading to withholding or delay in ABRAXANE dosing are neutropenia (41%), thrombocytopenia (30%), and anemia (16%). In a randomized open-label trial of ABRAXANE in combination with gemcitabine for pancreatic adenocarcinoma [see Clinical Studies (14.3)], the most common (â‰¥ 20%) selected (with a â‰¥ 5% higher incidence) adverse reactions of ABRAXANE are neutropenia, fatigue, peripheral neuropathy, nausea, alopecia, peripheral edema, diarrhea, pyrexia, vomiting, decreased appetite, rash, and dehydration. The most common serious adverse reactions of ABRAXANE (with a â‰¥ 1% higher incidence) are pyrexia (6%), dehydration (5%), pneumonia (4%) and vomiting (4%). The most common adverse reactions resulting in permanent discontinuation of ABRAXANE are peripheral neuropathy (8%), fatigue (4%) and thrombocytopenia (2%). The most common adverse reactions resulting in dose reduction of ABRAXANE are neutropenia (10%) and peripheral neuropathy (6%). The most common adverse reactions leading to withholding or delay in ABRAXANE dosing are neutropenia (16%), thrombocytopenia (12%), fatigue (8%), peripheral neuropathy (15%), anemia (5%) and diarrhea (5%). Adverse reactions were assessed in 514 ABRAXANE/carboplatin-treated patients and 524 paclitaxel injection/carboplatin-treated patients receiving first-line systemic treatment for locally advanced (stage IIIB) or metastatic (IV) non-small cell lung cancer (NSCLC) in a multicenter, randomized, open-label trial. ABRAXANE was administered as an intravenous infusion over 30 minutes at a dose of 100 mg/m2 on Days 1, 8, and 15 of each 21-day cycle. Paclitaxel injection was administered as an intravenous infusion over 3 hours at a dose of 200 mg/m2, following premedication. 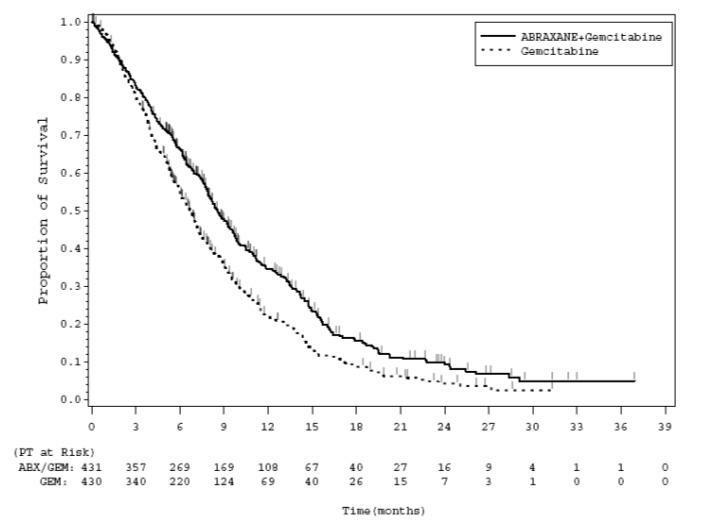 In both treatment arms carboplatin at a dose of AUC = 6 mgmin/mL was administered intravenously on Day 1 of each 21-day cycle after completion of ABRAXANE/paclitaxel infusion. The following common (â‰¥ 10% incidence) adverse reactions were observed at a similar incidence in ABRAXANE plus carboplatin-treated and paclitaxel injection plus carboplatin-treated patients: alopecia 56%, nausea 27%, fatigue 25%, decreased appetite 17%, asthenia 16%, constipation 16%, diarrhea 15%, vomiting 12%, dyspnea 12%, and rash 10% (incidence rates are for the ABRAXANE plus carboplatin treatment group). Table 7 provides the frequency and severity of laboratory-detected abnormalities which occurred with a difference of â‰¥ 5% for all grades (1-4) or â‰¥ 2% for Grade 3-4 toxicity between ABRAXANE plus carboplatin-treated patients or paclitaxel injection plus carboplatin-treated patients. Table 8 provides the frequency and severity of adverse reactions, which occurred with a difference of â‰¥ 5% for all grades (1-4) or â‰¥ 2% for Grade 3-4 between either treatment group for the 514 ABRAXANE plus carboplatin-treated patients compared with the 524 patients who received paclitaxel injection plus carboplatin. Table 9 provides the frequency and severity of laboratory-detected abnormalities which occurred at a higher incidence for Grades 1-4 (â‰¥ 5%) or for Grade 3-4 (â‰¥ 2%) toxicity in ABRAXANE plus gemcitabine-treated patients. Table 10 provides the frequency and severity of adverse reactions which occurred with a difference of â‰¥ 5% for all grades or â‰¥ 2% for Grade 3 or higher in the ABRAXANE plus gemcitabine-treated group compared to the gemcitabine group. Grade 3 peripheral neuropathy occurred in 17% of patients who received ABRAXANE/gemcitabine compared to 1% of patients who received gemcitabine only; no patients developed grade 4 peripheral neuropathy. The median time to first occurrence of Grade 3 peripheral neuropathy in the ABRAXANE arm was 140 days. Upon suspension of ABRAXANE dosing, the median time to improvement from Grade 3 peripheral neuropathy to â‰¤ Grade 1 was 29 days. Of ABRAXANE-treated patients with Grade 3 peripheral neuropathy, 44% resumed ABRAXANE at a reduced dose. Adjustment of the starting ABRAXANE dose is not required for patients with mild to moderate renal impairment (estimated creatinine clearance â‰¥30 to <90 mL/min) [see Clinical Pharmacology (12.3)]. There are insufficient data to permit dosage recommendations in patients with severe renal impairment or end stage renal disease (estimated creatinine clearance <30 mL/min). The active agent in ABRAXANE is paclitaxel, a microtubule inhibitor. The chemical name for paclitaxel is 5Î²,20-Epoxy-1,2Î±,4,7Î²,10Î²,13Î±-hexahydroxytax-11-en-9-one 4,10-diacetate 2-benzoate 13-ester with (2R,3S)-N-benzoyl-3-phenylisoserine. In vitro studies with human liver microsomes and tissue slices showed that paclitaxel was metabolized primarily to 6Î±-hydroxypaclitaxel by CYP2C8; and to two minor metabolites, 3'-p-hydroxypaclitaxel and 6Î±, 3'-p-dihydroxypaclitaxel, by CYP3A4. In vitro, the metabolism of paclitaxel to 6Î±-hydroxypaclitaxel was inhibited by a number of agents (ketoconazole, verapamil, diazepam, quinidine, dexamethasone, cyclosporin, teniposide, etoposide, and vincristine), but the concentrations used exceeded those found in vivo following normal therapeutic doses. Testosterone, 17Î±-ethinyl estradiol, retinoic acid, and quercetin, a specific inhibitor of CYP2C8, also inhibited the formation of 6Î±-hydroxypaclitaxel in vitro. The pharmacokinetics of paclitaxel may also be altered in vivo as a result of interactions with compounds that are substrates, inducers, or inhibitors of CYP2C8 and/or CYP3A4 [see Drug Interactions (7)]. After a 30-minute infusion of 260 mg/m2 doses of ABRAXANE, the mean values for cumulative urinary recovery of unchanged drug (4%) indicated extensive non-renal clearance. Less than 1% of the total administered dose was excreted in urine as the metabolites 6Î±-hydroxypaclitaxel and 3'-p-hydroxypaclitaxel. The effect of hepatic impairment on the pharmacokinetics of paclitaxel following ABRAXANE administration was studied in patients with advanced solid tumors. The results showed that mild hepatic impairment (total bilirubin >1 to â‰¤1.5 x ULN, AST â‰¤10 x ULN, n=8) had no clinically important effect on pharmacokinetics of paclitaxel. Patients with moderate (total bilirubin >1.5 to â‰¤ 3 x ULN, AST â‰¤10 x ULN, n=7) or severe (total bilirubin >3 to â‰¤5 x ULN, n=5) hepatic impairment had a 22% to 26% decrease in the maximum elimination rate of paclitaxel and approximately 20% increase in mean paclitaxel AUC compared with patients with normal hepatic function (total bilirubin â‰¤ULN, AST â‰¤ULN, n=130). [see Dosage and Administration (2.4) and Use in Specific Populations (8.6)]. The effect of pre-existing mild (creatinine clearance â‰¥60 to <90 mL/min, n=61) or moderate (creatinine clearance â‰¥30 to <60 mL/min, n=23) renal impairment on the pharmacokinetics of paclitaxel following ABRAXANE administration was studied in patients with advanced solid tumors. Mild to moderate renal impairment had no clinically important effect on the maximum elimination rate and systemic exposure (AUC and Cmax) of paclitaxel [see Use in Specific Populations (8.7)]. A multicenter, randomized, open-label study was conducted in 1052 chemonaive patients with Stage IIIb/IV non-small cell lung cancer to compare ABRAXANE in combination with carboplatin to paclitaxel injection in combination with carboplatin as first-line treatment in patients with advanced non-small cell lung cancer. ABRAXANE was administered as an intravenous infusion over 30 minutes at a dose of 100 mg/m2 on Days 1, 8, and 15 of each 21-day cycle. Paclitaxel injection was administered as an intravenous infusion over 3 hours at a dose of 200 mg/m2, following premedication. In both treatment arms carboplatin at a dose of AUC = 6 mgmin/mL was administered intravenously on Day 1 of each 21-day cycle after completion of ABRAXANE/paclitaxel infusion. Treatment was administered until disease progression or development of an unacceptable toxicity. The major efficacy outcome measure was overall response rate as determined by a central independent review committee using RECIST guidelines (Version 1.0). A multicenter, multinational, randomized, open-label study was conducted in 861 patients comparing ABRAXANE plus gemcitabine versus gemcitabine monotherapy as first-line treatment of metastatic adenocarcinoma of the pancreas. Key eligibility criteria were Karnofsky Performance Status (KPS) â‰¥70, normal bilirubin level, transaminase levels â‰¤ 2.5 times the upper limit of normal (ULN) or â‰¤ 5 times the ULN for patients with liver metastasis, no prior cytotoxic chemotherapy in the adjuvant setting or for metastatic disease, no ongoing active infection requiring systemic therapy, and no history of interstitial lung disease. Patients with rapid decline in KPS (â‰¥10%) or serum albumin (â‰¥20%) during the 14 day screening period prior to study randomization were ineligible. In the intent to treat (all randomized) population, the median age was 63 years (range 27-88 years) with 42% â‰¥ 65 years of age; 58% were men; 93% were White and KPS was 90-100 in 60%. Disease characteristics included 46% of patients with 3 or more metastatic sites; 84% of patients had liver metastasis; and the location of the primary pancreatic lesion was in the head of pancreas (43%), body (31%), or tail (25%).